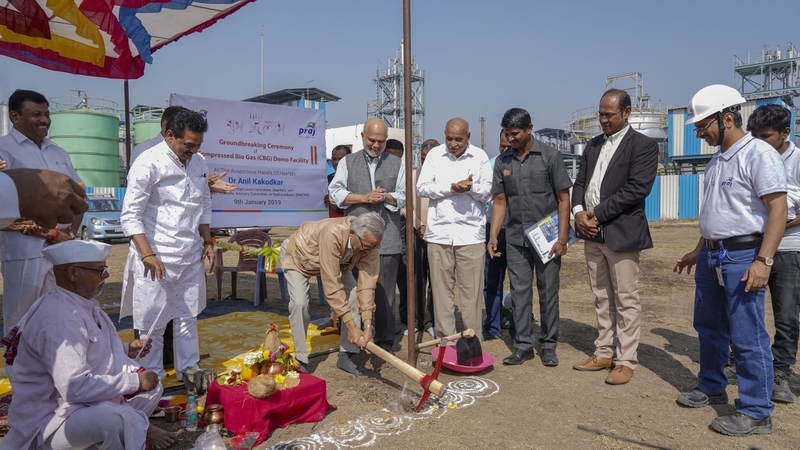 The ground breaking ceremony of Praj’s integrated demo Bioethanol plant of Compressed bio-Gas (CBG) was initiated at the hands of Dr. Anil Kakodkar, Chairman - High Level Committee and Chairman- Scientific Advisory Committee on Hydrocarbons of Ministry of Petroleum and Natural Gas. This ceremony was held at the Shreenath Mhaskoba Surgar Factory, which is adjacent to the existing 2nd Gen Bio-Refinery demo facility that is operational since past 3 years. Praj also unveiled its roadmap for commercialization of CBG technology and reaffirmed its readiness by way of required infrastructure to execute multiple CBG plants with advanced technology and designs. In October of 2018, The Govt. of India released a policy called “Sustainable Alternative Towards Affordable Transportation” (SATAT) which envisages implementation of 5,000 Compressed Bio-Gas plants in the next 5 years. CBG is a complementary renewable transportation fuel to Compressed Natural Gas (CNG). Praj’s CBG technology is a major step in that direction. Dr. Anil also appreciated the efforts of the plant developed by Praj for bringing this possibility within a striking distance quoting,“..the impact of bio-energy is going to be huge” and congratulated Mr. Pramod Chaudhari, Exec. Chairman Praj industries ltd. for a very well thought out and developed plan for the bioenergy plant. Praj is a global process solutions company driven by innovation and integration capabilities, offering solutions to add significant value to Bio-ethanol facilities, Brewery plants, Water & Wastewater treatment systems, Critical Process Equipment & Systems, Hipurity solutions and Bio-products. Over the past three decades, Praj has focused on Environment, Energy and Agri process led applications. Praj has achieved a status as the most trusted and technologically updated ethanol plant manufacturers, providing expertise in process engineering, plant & critical equipment and systems with over 750 references across five continents. Solutions offered by Praj are backed by its state of the art R&D Center called Praj Matrix. Led by an accomplished and caring leadership, Praj is a socially responsible corporate citizen. Praj is listed on the Bombay and National Stock Exchanges of India.